Medicinal uses: Acts as a tonic for the nervous system and can be used for nervous exhaustion, long term anxiety, sleep difficulties, as well as depression. It may also be helpful in treating addictions. It may also relieve the lowered vitality experienced in menopause. The infused oil stimulates tissue repair and is applied to burns and wounds. It can also relieve nerve pain and can be massaged into the skin in toothache, sciatica, and joint pain. 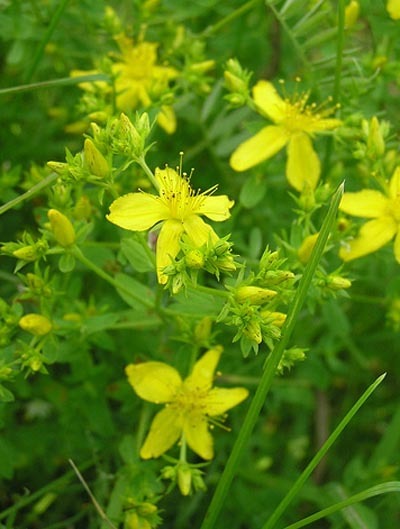 Internally it can be taken to heal peptic ulcers (Chevallier 108). Additional uses: Yellows and reds can be obtained from the flower tops and stems depending on the mordant used (Kowalchik 448). Cautions: Can cause sensitivity to sunlight. Due to possible interactions, seek professional advice if taking a prescribed medicine (Chevallier 108).